This Indian restaurant on King Street in Hammersmith specialises in Keralan cuisine. There is also a small selection of Punjabi dishes on the menu that look a little lost amongst a fairly exhaustive Kerala menu. They're probably around for the nervous diner who'd prefer to stick to the tried and tested, since Kerala food has a distinctive flavour that could be quite unfamiliar to many. Kerala is a south-western state in India, with a long coastline, called the Malabar coast. It's often referred to as the land of spices, since it's traded in local spices like cardamom, cloves, black pepper, ginger and cinnamon for centuries. Tamarind and coconut are also used a plenty in Kerala dishes. And the long coastline is conducive to a flourishing fishing industry, making seafood an integral part of its cuisine. Three visits to Shilpa, two of those with a bunch of friends and one a birthday dinner with a friend who ordered more food than either of us knew we'd realistically be able to finish, means I've had the opportunity to sample many of Kerala's delicious dishes on Shilpa's menu. Never have I been disappointed. Before we launch into food talk, a moment to talk about the ambience. Don't go expecting fancy schmancy. Don't go expecting gorgeous interiors and impeccable service. Shilpa isn't about either of those; that doesn't mean you can fault the service or the ambience - they're adequate and nothing more - and that's fine - because what Shilpa is about is the food. 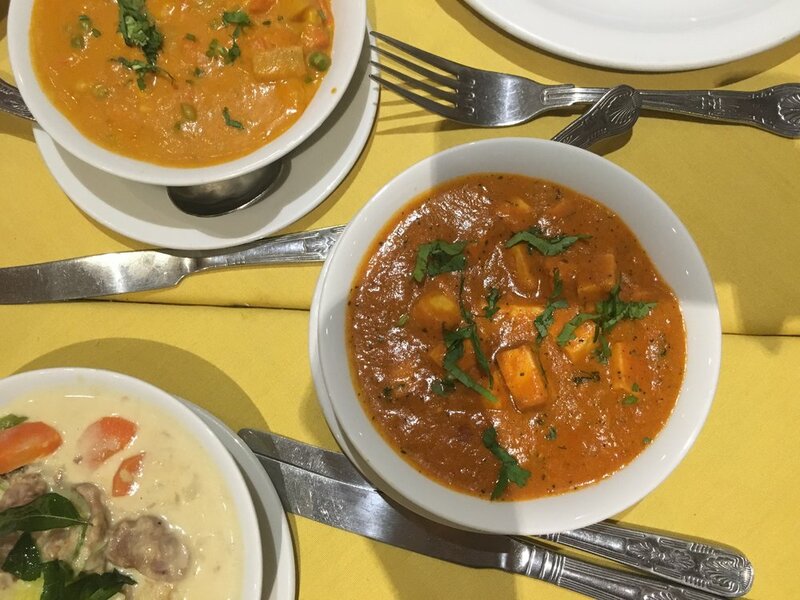 Authentic Kerala food in the heart of London. There are a few things on the menu I would definitely recommend trying. Begin with the Cheeraila soup. This is a spinach soup tempered with garlic, ginger, curry leaves, shallots and black pepper. And while you have your soup, munch on some Nenthraka Porichathu, or gramflour fritters, and Aatirachi Varattiyathu, which is diced deep fried lamb sautéed with ginger, garlic and shallots. Make sure you're nice and hungry when you go to Shilpa. There are too many things you'd want to sample! Moving on to the main course. Kerala kozhi roast (chicken marinated in traditional spices and then sautéed), the lamb stew (lamb cooked with vegetables in coconut milk), and Njandu thoran (crabmeat cooked with grated coconut, ginger and garlic, and tempered with mustard seeds and curry leaves) really stood out for me. Mop the lamb stew up with Appam, a lacy pancake with a soft centre, made of a fermented batter. And do order Shilpa's very lovely flaky layered Kerala parathas to accompany the other main dishes. What I really like about Shilpa is that it's so wonderfully laid back. You don't need to dress up, you don't need to mind your Ps & Qs, come as you are, come with a big appetite and let those fantastic Kerala flavours take over.